A FIX FOR DNS ERRORS!! | The First Place for Second Life. A FIX FOR DNS ERRORS!! Its now more than 24 hours since the problem started, and I’d like to extend a big thumbs up and thank you to Meghan Dench of the LindenLab Mentors group, and Spike Linden who spent a good portion of his time on skype with me trying to work out why about 25,000 people here in the UK couldnt log on to SL. Even though we couldnt fix it, at least those guys tried to help, nobody else did. Basically its all to do with DNS settings. I havent a clue about them, other than how to fix them, but they need to be changed, and here’s how we do it. I had looked at opendns last night, when trying to fix the problem by myself, but was convinced that setting it up on my router was too big a job. However with nothing to lose, I gave it a shot on my computer (not the router) and I’m very glad I did – it fixed all my problems!! Choose your connection from the Network Connections window. Mine was my wifi connection. If you have one called “internet” or “the internet” that prolly isnt it. You want wifi something, or ethernet something, etc. Find and click on the properties button. Click Internet Protocol (TCP/IP) and click Properties. It should say “obtain DNS automatically” and under that “Use the following DNS server addresses” and type in OpenDNS addresses in the Preferred DNS server and Alternate DNS server fields. Now, if you’re as technically minded as me (ahem) that’ll be a nightmare for you. Therefore, I have kindly liberated the step by step tutorial from opendns.com and reposted them here. Enjoy. These 2 are easy. 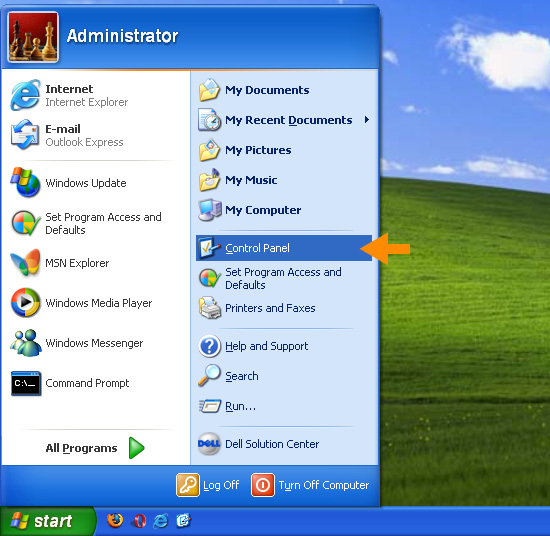 Click Start, Click Control Panel, Click “network connections”. This is where it gets a bit trickier. But you’re looking for something a bit like this, below. We’re soo nearly there. Bear with me tho cause this bit is slightly trickier. but not much. In the box that just opened, find properties again, and click it. Like the pic below. Find TCP/IP in the list. I had to scroll down to find mine, it was at the bottom. Highlight it by leftclicking it once, then click properties. Ok this is the last step so I’ve made the picture nice and big. Basically you want to click the “use the following dns addresses” like the picture, and enter the numbers shown. Then click O.K. Thats it!! You’re done!! you might get a flicker on your connection status for a second, for me it flicked up “Orange livebox 8G4W is now connected” or whatever, which I thought was odd as it’d been connected all day, but then when I tried to log into Secondlife, it worked!!! There’s a mac version of this fix that is pretty similar. If anyone needs that, let me know, and I’ll post it here. I’m generally going along the thinking of ‘macs just work, all the time’ as we’re always told (who knew that’d come back to haunt you, eh? hehe) or if you really are totally screwed with DNS problems, email me, or get one of your friends to email me your email address, or theirs, or whatever, and I’ll make and send out a PDF. Please post the Mac fix. You are the best source of info about this outage that there is! Well, in this case ALL OrangeBox support must be fired. It looks like they broke something on their DNS servers(with is provide automatically in windows) and couldn’t just check for that simple issue. p.s.But they Lindens doesn’t check this,strange.